While we do a lot of grilling outdoors and cooking in the SaraLinda, we really love to find great local places to grab a meal after a hard day of fishing. Below you’ll find highlights of some of our favorites as well as some “Honorable Mentions” (with our goto menu item). Bon Appetit! 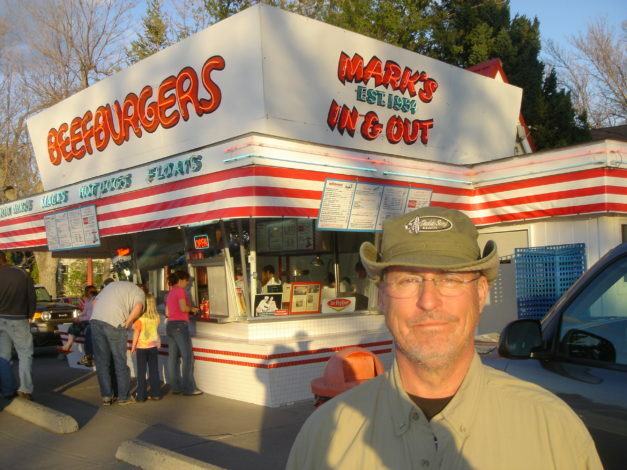 After a day on the Yellowstone River or exploring the northern part of Yellowstone National Park, our “regular” stop is at Mark’s In and Out, not to be confused with that California-based chain burger joint. This is as local a spot as you can get. Located on the main road into Livingston as you go north down Hwy. 89, Mark’s In and Out is a walk up place specializing in burgers, fries, rings and the best shakes and malts. The “vibe” is that of any other small town walk up burger joint. The staff are as friendly as you can imagine and in summer, you can typically count on a line of folks waiting to order…. but…. take our word on this, its totally worth it. Just look how happy Dr. James Kelley is in the pic above. Crumbs (McArthur, CA) / Everything, including chocolate bread pudding! Our guide, Matt Mitchell from the Fly Shop in Redding, on the Fall River, told us if we only ate at one place nearby it had to be Crumbs. He did warn us however, that we should make reservations as Crumbs was very popular with locals and visitors alike. Turns out, the chef at Crumbs was a chef at a fancy NYC restaurant originally and moved back to McArthur with his wife who was from the area. So, we called ahead, made a 6:30 reservation and proceeded to McArthur, which was about 10 minutes from our campground. Arriving at the address, we found a cute little cottage surrounded by beautiful flowers and vines. Inside was just as casually decorated and the food was absolutely amazing! Think gourmet food meets small town farm-to-table at small town prices and you have Crumbs. 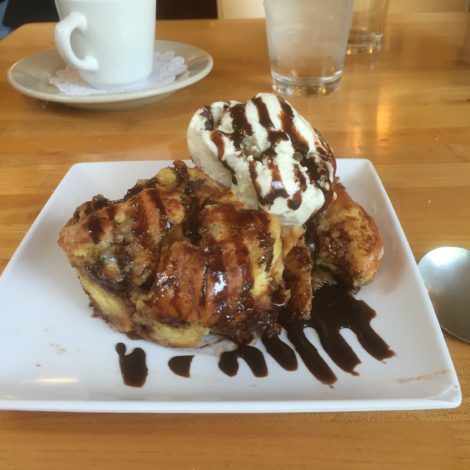 You can salivate over the pic above of our dessert from Crumbs, chocolate bread pudding. 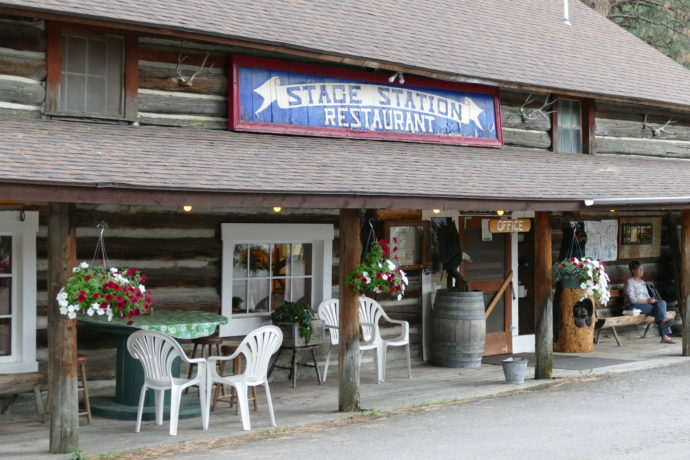 Tucked off the road that parallels Rock Creek as it flows into the Clarks Fork is a small RV park and restaurant, Ekstrom Stage Station. You’d never see it from I-90 as you head from Butte to Missoula, but you should definitely take the detour a bit off the interstate to enjoy dinner here. This is a down home, country cookin’ kind of restaurant that will leave you stuffed, but make sure you leave room for their desserts as well. Oh… and be sure to take one of their giant cinnamon rolls with you for breakfast the next day. We included Izaak’s in our Top 10 Beer-Drinking Establishments, but, we also need to include it in our “Good Eats” list. The food here is quite good and the clientele is all anglers, all day long. Check out more about Izaak’s in our Beer Post. This is one of the top burger spots in the country and actually, was rated a Top 100 Restaurant by Yelp! A great selection of 20 local craft brews is available to wash down burgers like the Blonde Bombshell Burger, Morning After Burger, the Screw It, I’m on Vacation Sticky Bunn and Bourbon Bacon Burger and my fav, the Uncle Bob’s Barbalicious BBQ Burger. We gave it an “Honorable Mention” in our Top 10 Drinking-Establishments because of its craft beers on tap. Just down the street along the Upper Sacramento River are plaques commemorating some of the famous fly fishing leaders from the area including Ted Fay. Yak’s sits in the beautiful little mountain town of Dunsmuir in Shasta County. Grand Lake Stream (ME) consists of 5 dead end streets (ending at water’s edge) with only one road in/out of town to the outside world. Where all those streets intersect, you’ll find the Pine Tree Store. It is the ONLY store in GLS that isn’t a lodge or fishing/hunting/outdoor outfitter. If you look it up on TripAdvisor, you’ll see its “#1 of 1” in GLS. Inside the Store you’ll find hunting/fishing gear, a small section of groceries, a cooler of beer and sodas and most surprisingly, a great grill with counter seating and one large community table. Usually, when we’re out with a guide, they’ll have a lunch packed for our wade/float trip which we eat somewhere in/along the river. In the case of fishing GLS with John Arcaro, when lunchtime came, we went tot he Pine Tree Store, walked right in wearing our waders, and sat down to burgers, fries and drinks. It was awesome, so good in fact that we came back and had several other meal; breakfast, lunch and dinner at the Store. It is the community center of GLS for locals and tourists alike. Our fishing guide on the Battenkill, Ray Berumen, asked us to meet him at the Wayside Country Store in West Arlington, VT, for our wade trip on the Battenkill River. While we were to meet him at 9am, he commented that we might want to get there around 8:30 and enjoy breakfast. Not one to miss every moment of sleep we can, we got there about 8:45, went inside and found ourselves transported back in time to a place where “Country Stores” like this existed everywhere, or at least everywhere in Vermont. Their motto, “If you can’t find it here, you don’t need it”. What endeared us most was the friendliness of the staff in the store, from the clerk behind the cash register to the folks running the deli. All of them going out of their way to make two “tourists” feel right at home. What was also welcoming was this huge round table where anyone who wanted could sit, read the paper, chat, and have breakfast or lunch. As we found out, BOTH breakfast and lunch were so good. We even enjoyed ice cream, maple-flavored of course, and dessert, sitting out front on the wooden bench. This was a real throwback in time treat. If you ever find yourself heading to the Orvis Flagship store or anywhere in and around Manchester (VT), head west down VT 313 (Battenkill Road) and about half way before you hit the NY state line, on the left you’ll find Wayside Country Store. As we were driving the SaraLinda to our campground to fish the Housatonic River, about 10 minutes out, we drove through the little town, Norfolk, CT. As we cruised the main street, we passed this huge green building, Infinity Hall. Intrigued, after we setup the RV at the campground, we went online to see what this place was all about. 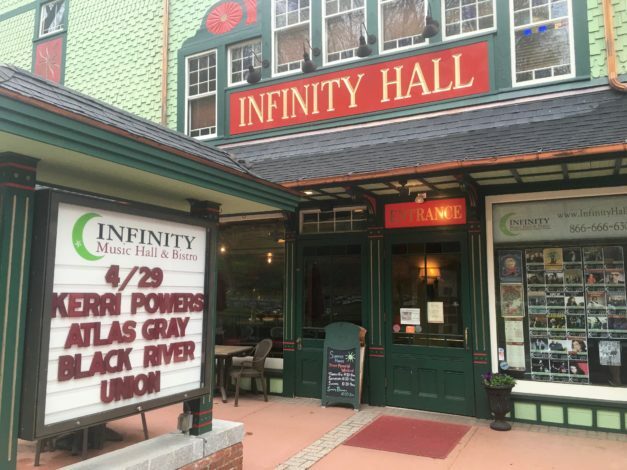 As the website explained, Infinity Hall was “Built in 1883 as a combination opera house, barbershop and saloon. Today, it is a thriving music venue and bistro that serves great pre-show meals in an intimate setting below the music hall. After a great day on the Housy with Bert from Housatonic River Outfitters, we had the pleasure of having dinner before hearing three local CT bands, including one who shared their music with us, Atlas Grey. Whenever you can get great food and music together, you have to stop…. so make sure if you’re ever near Norfolk CT, you stop in at Infinity Hall and Bistro. Full disclosure, we absolutely love the northeast corner of Yellowstone National Park…. who wouldn’t…. less crowded, great wildlife and the fishing…. wow! We’ve fished every stream in every direction from Tower Junction including the Lamar, Soda Butte, Slough Creek, Yellowstone, Tower Creek, Pebble Creek and a few “Nunya” tributaries. 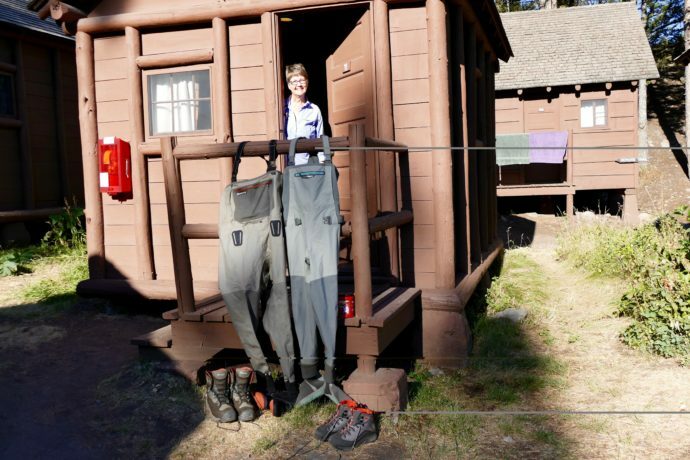 Our “go to” spot to stay in YNP is Roosevelt Lodge and we usually end up in one of their “no frills” cabins (aka. twin bed, heater, desk, no restroom, no sink) as seen in the pic above. Our day in this area often unfolds this way; breakfast, the moment the Roosevelt Lodge Dining Room opens, fishing all morning, lunch on the river (crackers, fruit, energy bars, H2O), dinner, the moment the Lodge dining room opens at 5pm, and then back to the rivers for fishing until dark. Breakfast options abound with all the regulars, but the Wrangler’s Skillet is my favorite. For dinner, again, options galore, but at least once you’ve got to enjoy their Applewood Smoked BBQ Ribs and Roosevelt Beans. Yum!!! Wolfe’s General Store (Slate Run, PA) / ANY deli sandwich! Rock Inn (Estes Park, CO) / Pizza, you build it! Slow Groovin’ BBQ (Marble, CO) / ummmm BBQ! Breakfast Club (Mammoth Lakes, CA) / Eggs, bacon, pancakes… BREAKFAST! Our last post, Top 10 Beers, detailed actual brews we loved along our River Ramble. This post targets the actual establishments where we drank some amazing beers along the 487 x 34,585 x 95 x 149 we traveled. However, each of the establishments listed isn’t just about the beer, but also includes other factors such as proximity to the river, overall ambiance, staff friendliness, quantity of beers available, quality of beers available, live music, and other totally subjective measures. So without further ado, here are our Top 10 Beer-Drinking Establishments (and a few honorable mentions!). We might not have found this one were it not for our good friends Chuck and Marty Raplinger. They’d been to Estes Park, a bit before we got there to fish the Big Thompson River, and recommended Rock Inn to us as a place we should visit. When we arrived at what we thought was an “early” time to beat the crowds, we were met with a full parking lot and headed inside to the bar for a cold beer. We were lucky enough to find two seats at the bar and proceeded to enjoy some Friar Chuck’s from Black Bottle Brewery; 99 Schilling from Odell Brewing and some Ellie’s Brown Ale from Avery Brewing. Rock Inn has a great selection of craft beers from local breweries, a great menu and live music. Our amazing guide on the West Branch of the Ausable, Rachel Finn, highly recommended we head to Lake Placid Pub & Brewery for some Ubu’s. We arrived for lunch on a cold, rainy weekday and found a spot near a window overlooking a lake. Beautiful setting, incredible beer, great food and yes, live music. In addition, while you’re in Lake Placid, just down the street is the Olympic hockey rink where the “Miracle on Ice” occurred, the high school track where Olympic outdoor speed skating happened and a great little downtown area. Sure, most pizza places serve beer, but K-Bar takes it to another level. We talked with the owner, who happens to be a big beer aficionado, and he told us he prides himself on making sure K-Bar has the best selection of local craft beer possible. In addition, they have some of the best pizza anywhere. This has been our “go to” spot for a long time at the north entrance to Yellowstone National Park. After we’d fished the Lackawanna River “Urban Oasis” with Adam Nidoh of A&G Outfitters, we asked him for a lunch/bar recommendation. He immediately suggested Smilers a few blocks away in Dickson City. Turns out, Smilers is a local neighborhood bar and grill in Dickson City, which is really a suburb of Scranton (PA). It’s not a brewery and it’s not in a picturesque setting like all the rest of the “establishments” on this list. So what sets Smilers apart, the people. We were obviously not locals or regulars, and we were still dressed in our fishing pants and shirts, but everyone from staff to the regulars welcomed us the moment we entered. We sat at the bar, had amazing service, amazing food and all the “regular” beers and a great selection of “local” beers you might find in a neighborhood bar. What started as a great place to grab lunch after a 1/2 day on the Lackawanna, quickly turned into a few hours at the bar, sampling food and brews, talking with the owner, the barkeep and others at the bar. Fun! When you go to fish the Big Hole River, you could stay in Butte or Dillon, but I’d highly recommend staying in Melrose at the Sportsmans Motel. Its right next to the Sunrise Fly Shop which has a bevy of guides ready to row you down the Big (fast) Hole like Cory Calkins. At the beginning or end, or even in the middle of the day, when you need some nourishment and perhaps an adult beverage, just South of the fly shop is the Hitching Post. This is the quintessential Montana bar that has a great food menu. As always, Barb and I bellied up to the bar for several meals and brewskis at the Hitching Post. Like most Montana bars, you’ll find the usual “national” beers, but also a collection of local Montana beers, like my favorite beer, Cold Smoke. Golden Trout Kolsch German-Style Ale from Mammoth Brewing was #3 on our Top 10 Beers. Now, combine that with sitting either inside, beside giant picture windows, or outside on the deck, looking up at the Sierra Nevada mountains painted with fluffy white snow, and you have #5 on our “Establishments” list. Top it off with great food service at the brewery tasting room provided by The Eatery and you have a recipe for success. Boiling Springs (PA) was founded in 1750 and the Boiling Springs Tavern came into existence in 1832, originally established as the Boiling Springs Hotel. It sits at the half-way point of the Appalachian Trail and directly across the street from the TCO Fly Shop. We frequented the Tavern on a few occasions. On our first visit, yes, sitting at the bar, we chatted with a hiker fresh off the Trail and then bought his beer when he was a little short of funds. Our next visit was after we’d caught the most elusive fish of our trip, a LeTort Spring Run brown trout, fishing with Jake Vilwock. While we didn’t venture into the dining room (a little too dressed up for us and we still in our fishing clothes), the bar is very comfortable, lots of polished wood and period pictures. They have great beers on tap, an awesome appetizer selection and friendly people all around. We’d had a great day fishing on the Tuckaseegee River with Miller Watson and were doing our riverside “Guide Talk” with him when we asked about best beer. In a heartbeat he said, “Innovation Brewing”. We all decided to meet there for a beer and headed toward downtown Sylva. Miller arrived and we sampled a few Innovation Brews and met the barkeep, who is a part of the duo, Bird in Hand, that plays at Innovation Brewing as well as many other regional and national venues. In true brewery style, they’ve got a food truck on site for the munchies. Sylva is one of those special places we found along our River Ramble, and Innovation Brewing, Bird in Hand and Miller Watson helped make it that way for sure. 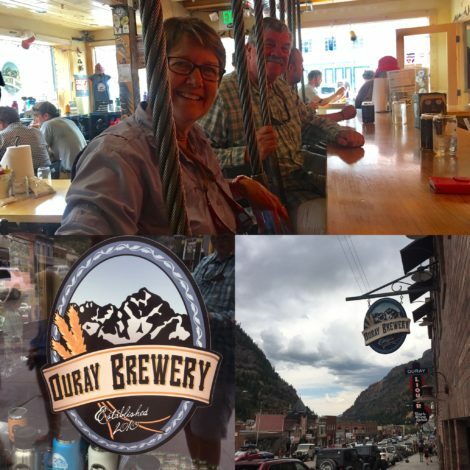 Ouray is a cool little town nestled among some of the most rugged and spectacular peaks in the Rocky Mountains, touting itself as the “Switzerland of America”. It has a tourist feeling in the summer as people from all over the world converge on the town to wander through the downtown shops, take advantage of the plethora of outdoor activities available, and yes, drink beer. But, it’s not just tourists who find themselves at the corner of 6th and Main, but locals as well. We sat at the bar in, how to describe them, swinging chairs held up by giant ski slope cables attached to the ceiling. The place was popping on a Sunday afternoon, the beer was cold and the food was delicious. We were introduced to fishing the Missouri River and hanging out in Craig by good friends Sue Doss and Dud Lutton of Bozeman. After a great float on the Missouri and checking into our rooms at the old mercantile in town, we headed across the street to Izakk’s. To be honest, in a list of our top 10 “Trout Towns”, Craig would be #1. So of course, the local bar/restaurant in our #1 town, Izakk’s, would occupy this spot. We always find a seat in the bar, order up a good local Montana brew, and tell fish stories…. repeating this process…. ordering some food…. and continuing. To continue the #1’s in this town, our “go to” beer is our #1 beer as well, Cold Smoke. Not a bad trifecta, drinking our #1 beer, in our #1 establishment in our #1 trout town. …. yes yes…. we visited a LOT of breweries! OK…. if you’ve been following our blog, or our Instagram feed, or hopefully both, you’ve likely noticed beer somehow works its way into our pictures and conversations. As a matter of fact, it’s one of our consistent questions of our fishing guides…. What is the best local beer and a local watering hole where we might find one? It turns out that sometimes, there is a great local beer, but not a local watering hole to get one. Often times, there is an awesome local watering hole, but not always do they have the “recommended” local beer. Well, this post is focused on our fav beers…. look for a future post highlighting our fav watering holes. A few caveats before giving you our Top 10. First, we’re not into the current IPA craze, so most of the beers are of a darker, maltier, less hoppy variety. Second, we drank some amazing brews at breweries that don’t distribute much beyond their brewery, so they didn’t make our Top 10 beers, but look for them to possibly show up on our fav places to drink beer. Third, we drank some awesome beers along the trip, but to make the Top 10, we had to be able to buy the beer within 20 miles of where the SaraLinda was parked. Mean Old Tom is a great example from Maine Brewing Company; it would definitely be a Top 10 beer, BUT, we couldn’t find it anywhere near where we fished in Maine. Finally, we can only drink so much, so we KNOW we’ve left some great local beers off our lists. However, given our local research and fly guide recommendations, these are our Top 10…. just view the video above to see if any of your favorites made our list!